When we found this land in '94, it satisfied nearly all of our requirements. Located close to the Unadilla River but at a good distance above the water's surface flooding was unlikely. During a recent flood all of the nearby bridges were closed until inspected so we could not drive anywhere but all of our land remained well above the flood water. Since seven more years of employment were in my future at that time, the retirement land had to be reasonably close to work. Privacy was an important issue but isolation was a deal breaker. The town road is close by but the house is located higher than the road resulting in no intrusion by road noise. The winding brush lined lane with no end in sight tends to discourage uninvited guests. These acres were part of a farm but were situated well above the river bottom land. Various level tracts at different elevations served primarily as pasture and we believed gardening was a possibility. After the sale closed we discovered that it was impossible to insert even a four tined spade into the ground. 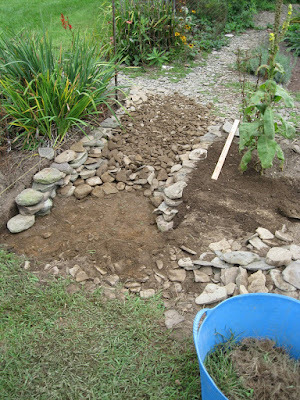 Stones were more numerous than soil so we had a problem. The five by thirty foot planned planting beds were to be surrounded by three foot wide broken stone paths. 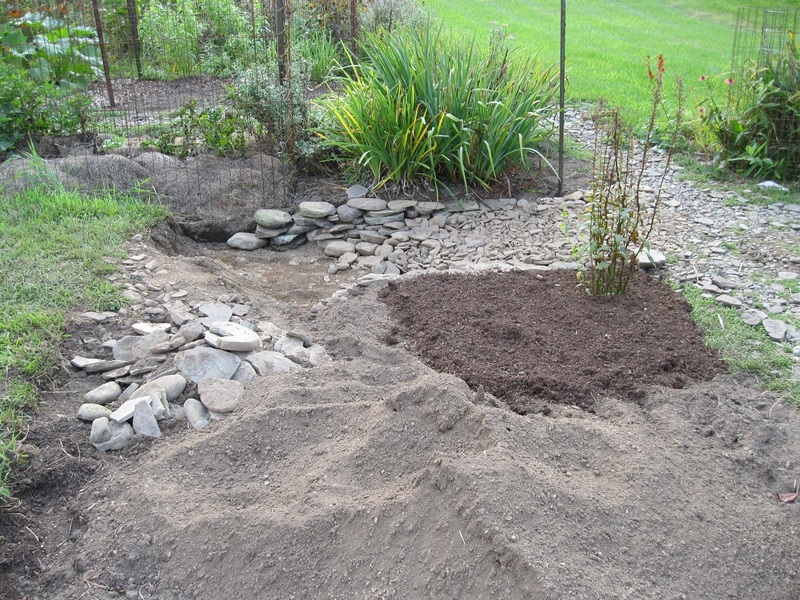 All that had to be done was to place the bed stones in the path and the path soil in beds. Two wheelbarrows, a shovel and a wire screen made the magic happen. I cannot begin to imagine how many hours were spent making stone free soil for the beds but I know that I enjoyed every minute of that job. There is something magical about the transformation from chaos to the finished product. It makes me feel good to step back and look at what just happened. 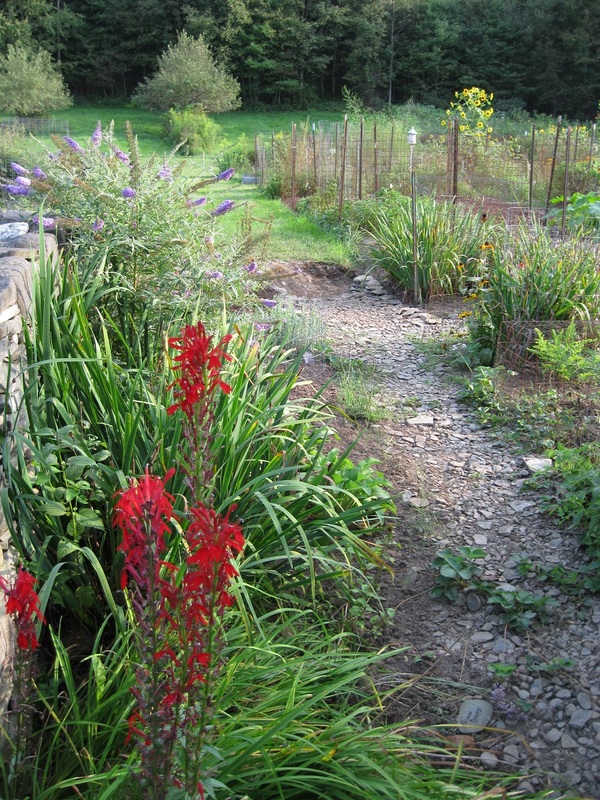 The area between the two planting beds remained unfinished for years. The draw of a new large project elsewhere kept me away from this short path. We are working to fill in the holes so that this place might actually sell. This soon to be finished path will allow for an easy walk from the garden to the lawn. Looking across a long finished path, it is difficult to tell just where the new work begins. A rainstorm will wash clean the recently unearthed stones making the new work look like it has always been there. Our first two hours of outside work happen here these days. This will continue to be job one until it is finished. We must come clean. The real reason for including this photo is to preserve the image of Cardinal Flower blooming close to one of our stone walls. That's a lot of stones! I don't mind digging up stones, and I think all the stone really looks pretty as an edging, but I hate when my shovel ends up hitting a boulder that I can't move. Your cardinal flower is gorgeous.